I love off the wall guitars. Always have, always will. At the January 2007 NAMM trade show in Anaheim, California I discovered the Eastwood Guitars booth and was amazed at the number of way-cool guitars they were producing, many of which were reissues of old Supro and Airline guitars. I can’t help myself. I’m an especially big fan of old Airline guitars. I’ve owned many over the years and have always dug their quirky shapes and sounds. Catching my eye in particular was an Airline H44 DLX in a copper finish, reminding me of the old 50’s Harmony/Kay Stratotone, which in those days was considered kind of a poor man’s Les Paul. The H44 sports a really cool small bodied, single cutaway shape with two mini-Humbuckers, a short trapeze tailpiece, three way selector switch and a master volume & tone control. When I got home after NAMM I kept thinking about it and ended getting one a month later. When I unpacked it, I was immediately struck by how beautiful it looked in its copper finish with just a hint of sparkle to it. I took it out of the box and immediately began twanging away. True to the original Stratotones, this guitar came with a fat “baseball bat” type neck. The advantage of a fat neck is that it’s very stable and practically un-warpable. Also like the originals, these guitars have a movable non-adjustable wooden bridge with a fixed compensated saddle. With a set of 10’s the action was good, and the intonation was pretty darn close. I noticed the bridge moved around a bit whenever I would bend the strings (just like the old ones), so I remedied the problem with an old bluesman’s fix; I just put a few short strips of double stick tape underneath the bridge and voila! It held like a champ even on my wildest bends. The tuners are open-faced, again just like the old ones. Some people think open faced tuners “slip”, but that’s a load of hogwash. I always wrap the string around itself against the tuning post, which kind of “locks” the string, and when I do that along with stretching the string a few times it always stays in tune. No problems with the tuners here. The string slots on the nut were a tad on the tight side, “pinging” now and then when tuning. A little bit of Big Bends Nut Sauce lubricant took care of the problem. Note: Tight string slots at the nut is the number one reason guitars don’t stay in tune. Always keep some lubricant handy and you’ll be a happy (and in tune) camper. So how did it sound plugged in? Very cool indeed! Mini humbuckers typically have a darker sound than single coils, plus they’re more powerful, so it’s important to set an amp’s controls accordingly. I first revved it up through a small Roland Microcube amp. It was quite at home here. There were plenty of modeling amp settings that I could find to make it sound good. Then it was on to a Line 6 POD in my studio, going direct into the recording console. With a few little tweaks I had some very bluesy sounding tones happening through the studio monitors. Nice! 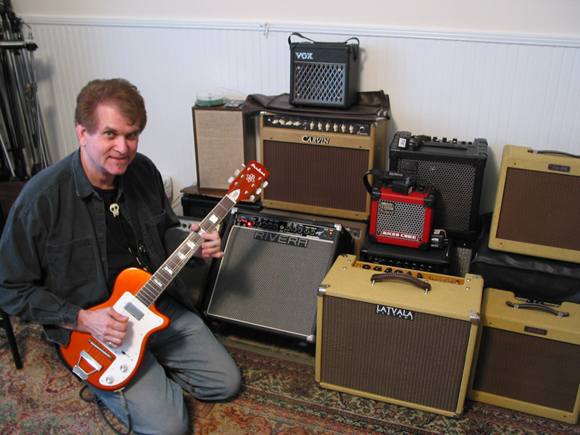 Next it was on to a Rivera 45 watt 1-12 Clubster combo amp. There was no problem dialing up a nice, slightly overdriven Mike Bloomfield “Super Session” kind of sound. I liked it mostly clean, but with just a hint of amp distortion. And finally, I ran it through a 15 watt Fender Blues Junior amp and it sang out like it owned the joint! Here’s my take on guitars like the H44 ‘ they’re specialty instruments meant to create unique guitar tones that normal Strat, Tele and Les Paul guitars can’t do. I use guitars like this a lot in the studio when I’m looking for something different to add character to a track, or on a live gig to give a different mojo to a song. I find that when a guitar sounds a little different, it will make you play a little different. I already know what I sound like with my usual guitars. But what can I paint with a different paintbrush? Conclusion? I like my H44. It’s built like an old guitar, but without old guitar hassles. It’s very cool looking and stable. Plus my wife digs the color. What can I say? She’s a keeper.